Today we’re sharing the hard work of Tom and Wendy Belinda, who have dedicated themselves to conserving habitat for endangered Indiana Bats on their land in Blair County, Pennsylvania. White-nose syndrome, human disturbance, and habitat loss have caused our nation’s bat populations to plummet. Close proximity to places where bats roost and hibernate makes the Belindas’ property prime real estate for bat conservation in Pennsylvania. Working with federal agencies like the USDA’s Natural Resource Conservation Service and the U.S. Fish and Wildlife Service, along with the Pennsylvania Game Commission and local partners, has allowed the Belindas to manage their property for the benefit of Indiana Bats and other vulnerable species. However, enhancing the health of their forests not only improves wildlife habitat, it also boosts the value and productivity of their land. A true win-win. Check out our bat story map to learn more about the nationwide effort to conserve bats. For more information about white-nose syndrome, visit www.whitenosesyndrome.org. This entry was posted in Blog entries, Endangered Species, Habitat restoration, Invasive species, Partnerships, Science and research, White-nose syndrome and tagged bat, bat conservation, bat disease, habitat, habitat management, indiana bat, NRCS, Pennsylvania, private landowners, usda, USDA Natural Resources Conservation Service on January 11, 2018 by arielkallenbachFWS. Ryan Crehan is a wildlife restoration biologist at the Lake Champlain Fish and Wildlife Conservation Office in Vermont. Wetlands are extraordinary, diverse places that provide critical habitat for countless birds, mammals, fish, plants, and invertebrates. From nesting habitat for wood ducks to spawning grounds for northern pike, wetlands are vitally important to many fish and wildlife species. In addition to wildlife habitat, wetlands provide numerous benefits such as flood protection, removing sediment and pollutants from lakes and rivers, and providing recreation opportunities. May is American Wetlands Month. In honor of these critical life support systems that protect our natural, cultural and economic resources, we bring you this inspiring video that highlights the incredible value and beauty of our natural world. For the past 8 years, the Service’s Partners for Fish and Wildlife Program has collaborated with the USDA Natural Resources Conservation Service, the Vermont Agency of Natural Resources and dozens of willing landowners to help restore more than 3,000 acres of wetlands on private land for the benefit of wildlife and people in the Lake Champlain Basin. Working in partnership, the project combined the funding and easement expertise of the NRCS with the biological and technical expertise of the Partners for Fish and Wildlife Program which assessed potential sites, conducted outreach to landowners, surveyed, designed and handled permitting and oversaw the implementation of these projects. This video highlights the success of the partnership while showcasing the significance of wetlands for both the natural world and the people that share it. This entry was posted in Blog entries, Fisheries, Habitat restoration, Partnerships, Science and research, Wetlands and tagged Chris Smith, Lake Champlain, lake champlain fish and wildlife conservation office, Partners for Fish and Wildlife Program, Ryan Crehan, USDA Natural Resources Conservation Service, vermont, wetlands, Wetlands video on May 6, 2016 by jenniferlapis. Beneath mountains and lakes, oceans and valleys, a treasure trove of hidden information is waiting to be discovered within the Earth’s soils. Jim Turenne has been unearthing and cataloging this valuable data since 1987, when he began working on county soil surveys in Massachusetts as a field soil mapper for the USDA Natural Resources Conservation Service or NRCS – a federal agency formerly known as the U.S. Soil Conservation Service. The NRCS works with private landowners to maintain, enhance and conserve their natural resources but they also have a close-working, collaborative partnership with the U.S. Fish and Wildlife Service. Today, Turenne serves as Rhode Island’s assistant state soil scientist. 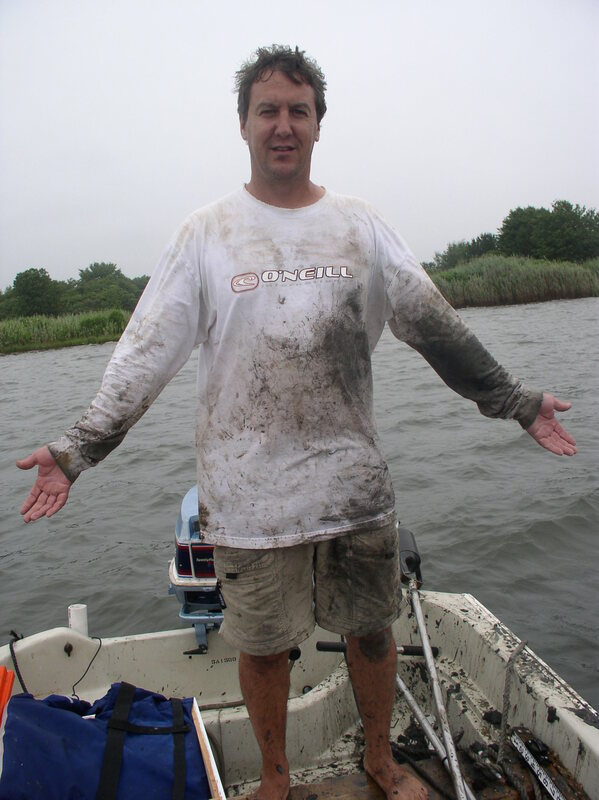 Most of his work in Rhode Island has involved collecting coastal and submerged soils data. Turenne works closely with the Service on a number of coastal resilience projects, including Protecting Property and Helping Coastal Wildlife, an effort to strengthen natural areas to act as buffers against storms and sea-level rise. The project is among 31 FWS coastal resilience projects supported by federal funding for Hurricane Sandy recovery. Through the Service’s MapCoast Partnership (an organization dedicated to mapping coastal underwater resources) the Service gains invaluable soil data sometimes necessary for resilience work and NRCS gets to add that same information in their collective database. As part of the Protecting Property and Helping Coastal Wildlife project, Turenne collected core soil sample data from the Narrow River in Narragansett, R.I. at John H. Chafee National Wildlife Refuge. One of the project goals is to build up marsh elevations along certain areas of the Narrow River to help compensate for a loss of sediment from storm and wave erosion, which leaves the marsh vulnerable to the effects of sea-level rise. Prior to dredging, soil samples were collected by Turenne and his team in site-specific locations to protect any possible cultural resources – or heritage assets – that might be hidden within soil layers. 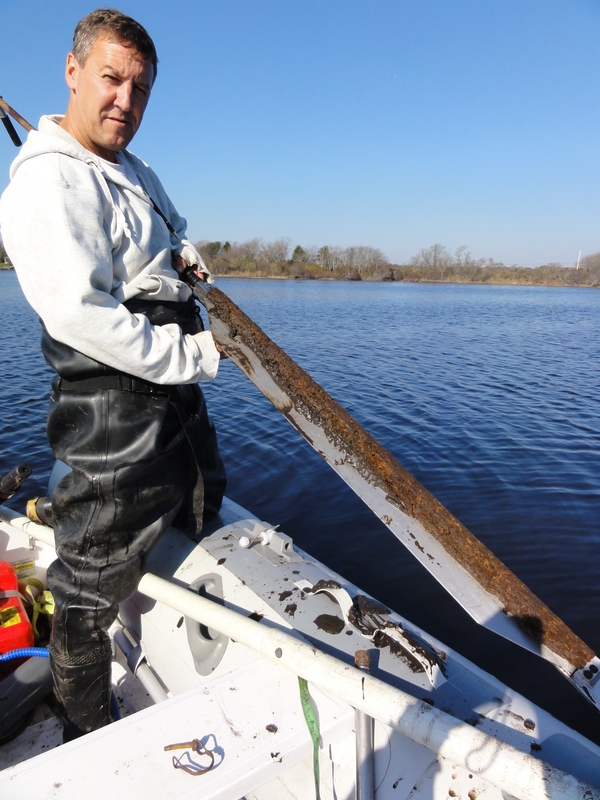 Core samples were also taken to determine if the wetland marsh soil could withstand the weight of 2-3 inches of sediment (dredge material) needed to successfully build up the marsh site. 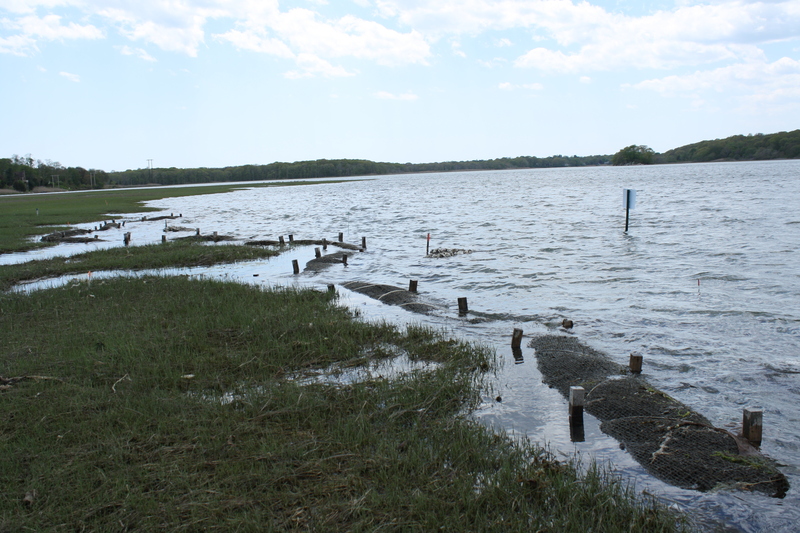 Other resilience projects, such as the use of man-made oyster reefs to bolster natural shoreline protection, sometimes require soil sample collection before on the ground construction begins. Consider an oyster reef needed on a marsh site where very little is known about the soil composition. If tested beforehand, the soil sample results can help determine whether the weight of the oyster reef will be supported by the soils there. An oyster reef placed on a site where the soil cannot support its weight will cause the shells to sink into the mud, resulting in a less-effective natural buffer. The Service relies on soil sample studies to ensure living shorelines will stay in place, protecting the coast for years to come. This entry was posted in Blog entries, Partnerships, Strong After Sandy and tagged #StrongAfterSandy, Hurricane Sandy, partnership, Rhode Island, U.S. Fish and Wildlife Service, USDA Natural Resources Conservation Service on August 28, 2015 by alirafws.